Known for spectacular runway shows and fetishistic fashions, Thierry Mugler came to his career in fashion design via dance and photography. Born in Strasbourg, France, in 1948, he studied at the Lycée Fustel de Coulange in Strasbourg from 1960 to 1965 and at the School of Fine Arts in 1966 and 1967. He performed as a dancer with the Rhine Opera Ballet in the 1965-1966 season. He moved to Paris and began working as a professional photographer while simultaneously freelancing as an assistant designer for a number of fashion houses in Paris, London, and Milan. Mugler showed his first ready-to-wear collection (using the brand name Café de Paris) in 1973 and obtained financial backing to open his own company, Thierry Mugler, in 1974. In 1986 he bought out his investors to obtain full ownership of the company. He opened a fragrance company in 1990 and scored considerable success with the perfume Angel in 1992. In that same year he showed his first couture collection. Mugler's characteristic style draws heavily on the iconography of sexual fetishism, and his models frequently resemble dominatrixes, from their towering high-heeled boots and corseted curves to such accessories as neck corsets and riding crops. Among his most notorious ensembles are a hot-red "cowboy" outfit consisting of hat, corset, chaps, and heels, modeled by a black transvestite, and his famous motorcycle bustier inspired by Detroit car styles of the 1950s. Mugler frequently made garments of leather and rubber, some of which make their wearers resemble giant insects drawn from science fiction. Examples of his less-theatrical outfits, such as his colorful and sharply tailored suits, were extremely popular, especially in the 1980s. 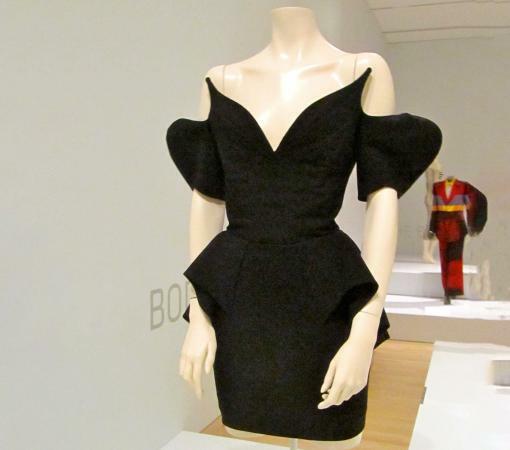 As of 2004 Mugler suspended designing both couture and ready-to-wear, although he continued to produce special costumes. See also Costume Designer; Cross-Dressing; Dance and Fashion; Fetish Fashion; Rubber as Fashion Fabric. Baudot, François. Thierry Mugler. New York: Universe/Vendome, 1998. Buxbaum, Gerda, ed. Icons of Fashion: The Twentieth Century. New York: Prestel, 1999. Thierry Mugler. Thierry Mugler: Photographer. New York: Rizzoli International, 1988. --. Fashion, Fetish, and Fantasy. London: Thames and Hudson, Inc., 1998.